Last quarter, I finished up the suggester framework for Input. When a user leaves feedback, registered suggester modules would look at the feedback metadata and text and return suggested links. The suggested links would then show up on the Thank You page. Users could then read a bit about the link and click on it if it was appealing. The first suggester I wrote does a search against SUMO kb articles to see if any of the kb articles seemed relevant to the feedback. Users frequently leave feedback about problems they're having that could be known issues with known solutions or even problems Firefox solves with features the user wasn't aware of. Because of this, it behooves us greatly to guide these users to the solutions that make their Firefox experience better. I wrote a post about that. This project covers adding a new suggester that allows analyzers to set up trigger rules for suggestions which is stored in the database. When feedback matches the criteria for a trigger rule, then the suggestion is shown. I pushed out the last code changes on September 9th, 2015. On September 25th, we created a trigger rule for feedback talking about Norton's addon and suggested a link for a SUMO kb article that talks about the problem. In the 5 days, 22 people saw the suggestion and 6 clicked on the link. This blog post is a write-up for the Trigger rule project phase 1. We need a system that lets us suggest links to users who are leaving feedback with certain criteria. We need to be able to generate these trigger rules quickly and we need to be able to analyze the success of the suggested links. Identify video playback issues and solicit more information on specifics. Identify webcompat issues and suggest user fill out a webcompat form. Identify known hot-fix issue and send user to documentation on how to fix it. Identify users with issues about a specific feature and send them to a survey with specific questions about their issues. We need an interface that shows all trigger rules, lets users create new trigger rules, lets users edit existing trigger rules and lets users test trigger rules without making them live. Writing rules engines is hard. You can get a feel for the hardness by looking at all the different systems you use for search: search engines, search in bug systems, search in email clients, search in music applications, etc. Some have very complicated forms that let you string together a series of clauses with ANDs and ORs and express a variety of different searches. Some have a complicated search syntax that's a mish-mash of English, algebra, set-theory and wishful thinking. Some are very sophisticated and you spend gobs of time tinkering with the various knobs to express the search you need to. Some are clunky and you spend gobs of time trying to coerce the system through hacky shenanigans into expressing a search it's clearly not meant for . It's a tough problem. To build a rules engine that solves all the possible use cases will take forever. I claim we can build a simple-ish engine that solves 80% of our important use cases and it'll be good enough for now. Ultimately, we want a rules engine that takes less than two weeks to design and implement, covers the use cases that have the most impact and is easy to use and reason about for the people building rules. All of this is further complicated by the user interface. Since rules will be created by people and there are consequences for building rules incorrectly, we needed an interface that is easy to use and easy to verify correctness with. We want rules to apply to multiple things so we don't have to create a rule for every variation of the situation. For locale, product, product version and keywords, we want to OR each possibility. For example, "feedback where product='Firefox' OR product='Firefox for Android'". Version is a little harder since we want to be able to group versions rather than have to specify each one. For example, we want to design rules that apply to all 41 versions rather than 41.0.1, 41.0.2, 41.0.3, 41.1, etc. Keywords and phrases is a tough one because we want to cover all the possible ways a user could express the thing, but we're hampered by the fact that we have to do the matching in Python code. We can't do a db lookup--takes too long. We can't do an Elasticsearch query--takes too long plus the feedback probably isn't in Elasticsearch, yet. I decided to fudge this one and put the keywords and phrases into a regular expression that's case-insensitive and unicode-aware. That should cover most use cases, though it will probably be awkward. It won't cover misspellings which we see often in feedback and it won't cover matching variations of phrases (e.g. "quick fox" and "quick brown fox") unless we explicitly list all the variations. Those are big limitations, but after looking at the data and use cases, I decided to push them off because I think we get a lot of value out of what we can express with regular expression matches. At some point we might want to add domain matching so we can better catch webcompat issues. I'm pushing that off for now. I spent some time fiddling with things and decided the easiest engine to build would look at locale, product, product version, existence of keywords/phrases and url as clauses ANDed together. keywords = word1,word2,word3,"this is a phrase"
The first two can't be handled by this system at all. The third item can be handled by splitting the trigger rule into multiple rules of smaller scope. I talked this over with the User Advocacy group and we agreed that this system is worth building and that it's useful enough for a first pass. And you wonder whether it was actually meant to successfully search anything at all. Creating and editing should be easy to implement; it's a basic CRUD interface with a view that lists existing rules with links to edit them and a link to create new rules. That should be straight-forward. See if the rule matches a specific feedback. See what existing recent feedback the rule matches. I think if I implement the second one, then that might be sufficient. Otherwise I have to figure out a way to specify the feedback to match in a way that doesn't require analyzers to add fake feedback to Input. Seems overly tricky. The infrastructure for suggesters and redirectors already exists, so we just have to implement a new suggester and a new redirector for the trigger rule suggester. 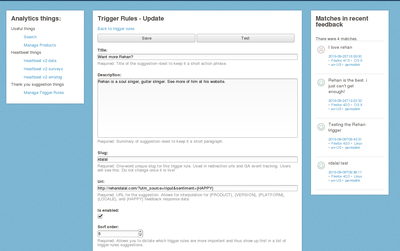 Then we need to implement some forms one of which allows us to test trigger rules against existing feedback. Since this is only available to analyzers, I'm going to cut some UI/UX corners around "prettiness"; usable is important, but pretty is not. 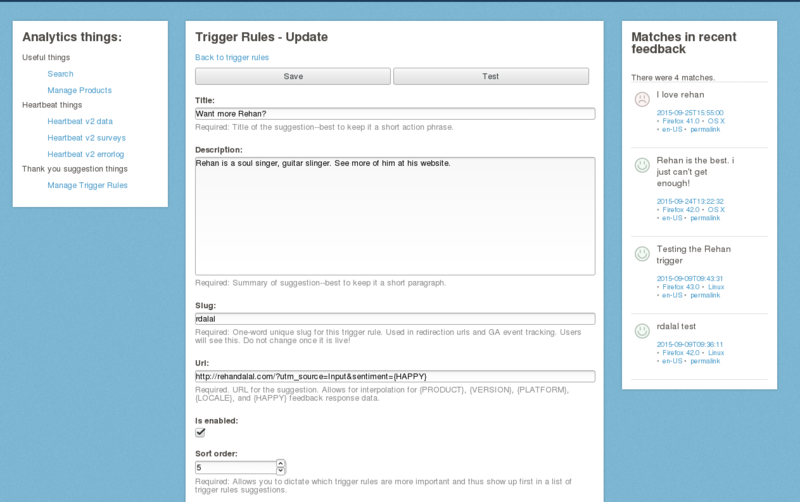 Trigger rule creating and testing. A modal overlay would break requirement 1. I could have matched feedback open up in a new tab, but that makes it hard to see the matched feedback and the trigger rule at the same time--you'd have to go back and forth. I could put the matched feedback above or below the trigger rule, but I think that's kind of the same as putting it in a new tab--you'd be flipping back and forth a lot. I settled on putting it on the right side. That seems good enough for now. I'll have the analyzers test it out and see whether it works for them or whether it's clunky. There are a bunch of things that I didn't implement. Some of them I waffled over whether they should be part of the initial implementation. Others I knew shouldn't be part of the initial implementation because there was no compelling need for them. We'll see how it gets used and what new use cases come up and figure out how to augment the initial implementation going forward. Software is a malleable thing. Supporting "this, but not that" clauses would probably be useful. It might also be helpful to be able to search with the analyzer search and then when you've got a search you like, turn that into a trigger rule. There are some huge technical issues with that, but nonetheless, it'd be a really great flow to support. Event flow is stored in Google Analytics. It'd be great to pull that data out and display it alongside the trigger rule in the list view page so that analyzers could see how many people saw the suggestion and how many people clicked on the link. Maybe it's helpful to have a report view for trigger rules that shows the number of people that saw the suggestion and the number of people that clicked over time. Links consist of a title and a description. Users only click on links that are attractive to them. For some use cases, we really want users to click on the link--perhaps there's some problem out there that we really need more information on. Changing the system so that we can iterate on making the title and description better would help here. Each suggestion is displayed with an icon. Suggestions are not all equal. There might be suggestions we really want users to click on for really important reasons. Perhaps the user is using a version of Firefox that they should upgrade because it has known security issues. Perhaps the user is leaving feedback on a problem we desperately need more help with. It'd be helpful to be able to specify which icon is displayed with the suggestion. Maybe it's helpful to show suggestions only some percent of the time? Maybe it's helpful to have two variations of a suggestion and show one 50% of the time and the other the other 50% of the time? Do we need to bake in A/B type testing into the system? Maybe it's helpful to have start and end dates for suggestions allowing us to do "campaigns"? Took a while to build this, but I think the impact of this feature will be pretty high. The point at which someone has left feedback is a magical touch point after which it's difficult to communicate with that person. 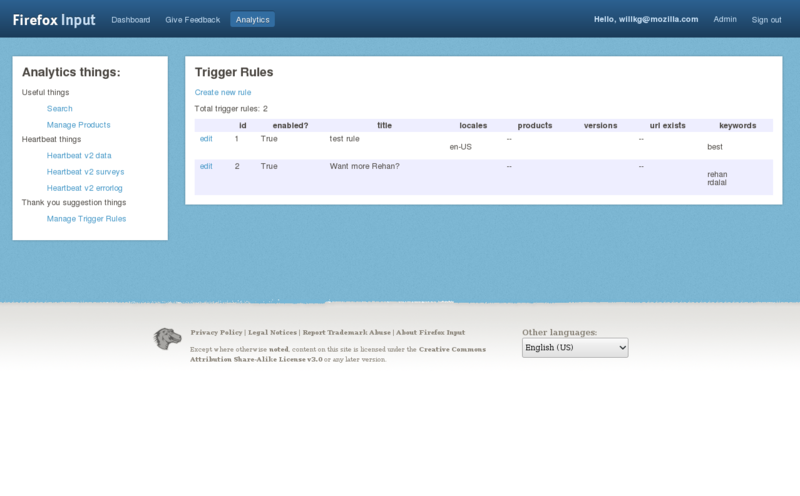 The trigger rule suggester gives us a way to help users who are having problems as well as a way for us to solicit help on problems that are difficult and complex. That's a big deal.